Read a capsule history of the Blue Ridge Parkway. 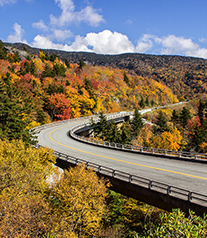 Over the course of 469 miles, the Blue Ridge Parkway passes overlooks and waterfalls, craft centers and historic farms, challenging hiking trails and leisurely paths. 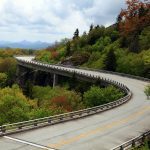 It invites locals and visitors to experience the region’s vistas, forests and streams, and has inspired the creation of other scenic driving routes throughout Appalachia such as The Crooked Road and the Mountain Music Trail. According to the National Park Service, in 2016 parkway visitors spent nearly a billion dollars in nearby communities, which helped support 15,337 local jobs. While the dollars can be quantified, what’s harder to explain is the magic of discovering a new trail, viewpoint or historical treasure, and the way the easily accessible drive introduces visitors from all walks of life to the region’s natural majesty. Below, we describe some of the highlights along the route. But don’t take our word for it — get out and explore! 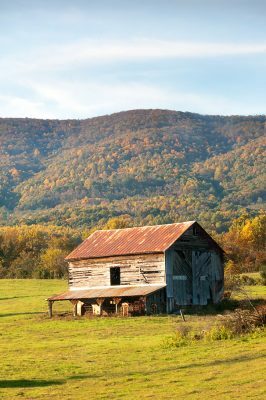 Near the beginning of the Blue Ridge Parkway and the town of Afton, Va., is an opportunity to learn about the parkway’s history. 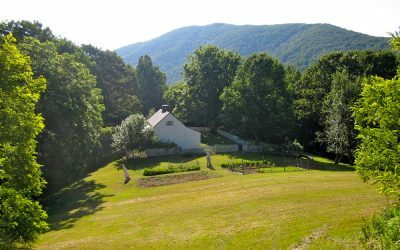 The visitor center is open year-round and has multiple indoor exhibits on the early mountain settlers in addition to the quarter-mile, wheelchair-accessible Mountain Farm Trail, which leads visitors on a walking history tour past an old cabin and farmland. In the summer, costumed interpreters demonstrate farm life at the turn of the 20th century. For striking vistas, follow the Humpback Rocks Trail one mile to its namesake viewpoint, or four miles to conclude at a picnic area. This parking area gives travelers a chance to climb the stone stairs at either side of the parking lot to visit a reconstructed railroad track where a 50-mile stretch of railroad was once used for logging. A short walk from the railroad exhibit leads to Wigwam Falls, a small cascade that is more prominent after a heavy rain or snowmelt. — M.A. 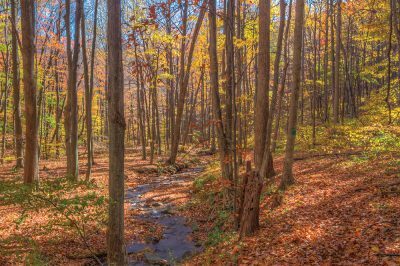 Hikers and historians alike can enjoy the Johnson Farm Trail, a two-mile loop from the Peaks of Otter Visitor Center parking area that leads to Johnson Farm. Once a functioning family farm for multiple generations of Johnsons, the site now serves as an interactive historical destination. Live demonstrations at the farm run through the summer, but visitors can explore the farmland during all seasons. 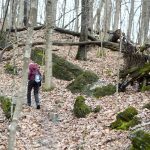 The Harkening Hill Trail, featuring a large boulder that balances on a smaller rock, connects to the Johnson Farm Trail and gives hikers the option of a more extensive 3.9-mile loop. — M.A. The Rock Castle Gorge Trail near Floyd, Va., offers countless sights along its 10-mile loop, including rock formations, overviews of the parkway and beautiful fall foliage, rolling fields with the occasional herd of cows and an old Appalachian Trail shelter that was used when the Appalachian Trail’s path once passed through. Since this is a longer hike with some strenuous sections, it is recommended to make this a full day trip. While there are multiple places on the parkway to reach this trail, the visitor contact station near milepost 169 is an easily accessible starting point. — M.A. Cumberland Knob marks the point where the building of the parkway initially began in 1935. There you can find a visitor center, an open picnic area and two hiking trails. 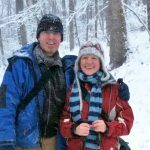 For a more leisurely hike, take the half-mile paved Cumberland Knob Loop that passes by the picnic shelter and the Cumberland Knob Overlook. 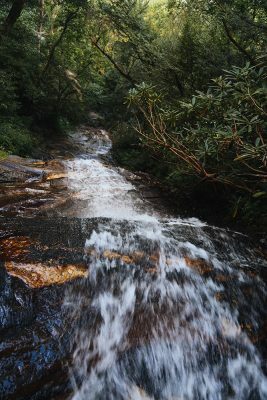 For a longer hike, walk the Gully Creek Trail, a two-mile loop that goes along a mountain stream and passes a waterfall and cascades. Cumberland Knob is located near the North Carolina and Virginia state line. — M.A. Martin and Caroline Brinegar built the Brinegar Cabin in the 1880s and lived off the land by raising crops and animals and selling local herbs. Caroline also practiced weaving and Martin made and sold shoes. 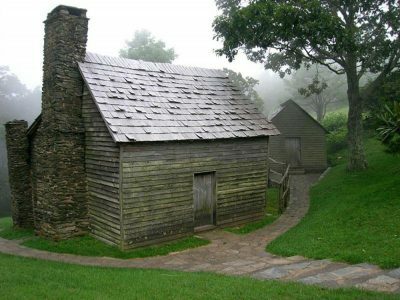 The cabin was sold to the Blue Ridge Parkway in the 1930s. It is now a place where visitors can appreciate rural mountain living at the turn of last century. At the parking area, you can also find the entrances of the Cedar Ridge Trail and the Bluff Mountain Trail. — M.A. 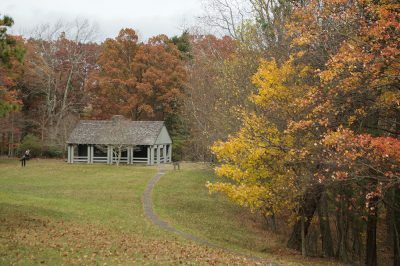 Created in 1968, the park hosts the log springhouse known as the Jesse Brown Cabin, originally built before 1840 and relocated to its current position in 1905, according to Frank and Victoria Logue’s “Guide to the Blue Ridge Parkway.” Another structure, the Cool Springs Baptist Church, was relocated to its current location by the National Park Service. 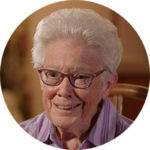 The park was named after E.B. 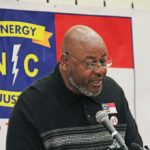 Jeffress, the chairman of the North Carolina Highway Commission in 1934 and a successful advocate against making the parkway a toll road. Picnic tables are available at the Cascades Overlook parking area at milepost 271.9. The 0.6-mile, one-way Tomkins Knob Trail leads to the historical structures and connects to Tomkins Knob Overlook at milepost 272.5. A 0.8-mile easy-to-moderate loop called Cascades Falls Trail leads to Cascades Falls. The tall, steep-sloping falls drop over a 250-foot rock face. Signs on the trail describe nearby vegetation and wildlife. The trail ends at two overlooks, one above and one beside the falls. This 7.1-mile trail allows hikers to gain 2,299 feet of elevation to reach the top of Calloway Peak. 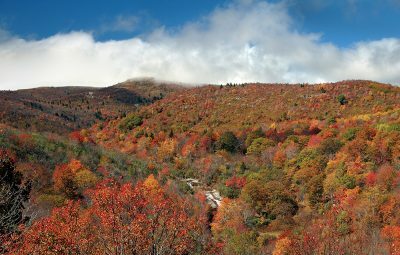 At 5,964 feet high, Calloway is the highest peak on Grandfather Mountain, which is known by the North Carolina State Parks System for being rich in ecological diversity. 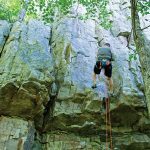 The route begins on the Tanawha Trail and switches to the Nuwati Trail, then Cragway Trail. When hikers reach Flat Rock, they switch to the white-diamond blazed Daniel Boone Scout Trail, which leads up to Calloway Peak. Ladders and cables are placed near the peak to assist hikers in their ascent. — R.P. Located near Blowing Rock, N.C., this park protects the historic 3,500-acre estate built by the textile entrepreneur and conservationist Moses Cone. 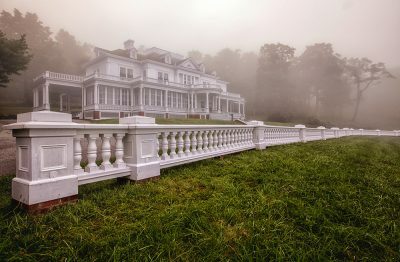 Flat Top Manor, a white mansion built for the Cone family in 1901, is now the Parkway Craft Center which presents crafts made by regional artists. There are 25 miles of graded carriage trails surrounding the mansion that are accessible by hiking or horseback riding. The trails lead to two lakes, the Cone family graves, an observation tower and rolling hills covered in wildflowers much of the year. Entrances to the manor and surrounding trails are located from mileposts 292.7 through 294. — R.P. 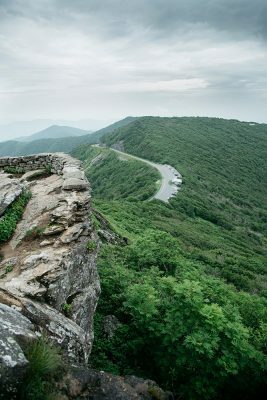 The Green Knob Observation tower is visible from the Blue Ridge Parkway near Mt. Mitchell. The tower, built by the U.S. Forest Service in 1931, sits on top of the Eastern Continental Divide and Green Knob Mountain, which is 5,080 feet tall. 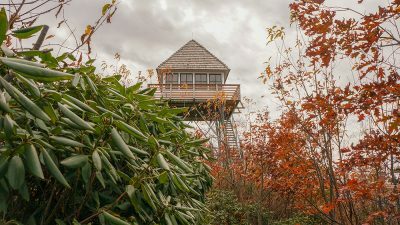 A cabin on the tower is locked unless a guided hike is underway, but the balcony is still accessible for breathtaking views of the Great Craggy Mountains, Table Rock, Grandfather Mountain and the North Carolina Piedmont. The trailhead is located 100 yards north of the Green Knob Overlook on the opposite side of the road. A half-mile yellow-blazed trail climbs roughly 340 feet in elevation, and is typically overgrown and hard to locate. — R.P. 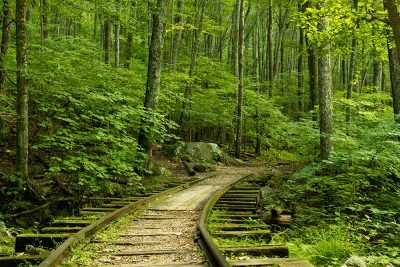 The Great Craggy Mountains offer two trails that start along the parkway: the Craggy Gardens Trail and the Craggy Pinnacle Trail. The Pinnacle Trail is a moderate 1.4-mile hike, while the Gardens Trail is an easy one-mile hike. Both are seasonally filled with blooming rhododendron, blueberries, blackberries and wildflowers. The Craggy Gardens Trail runs from the far south side of the visitor’s center parking area at milepost 364.4 to the picnic area. The Pinnacle Trail is north of the visitor’s center and can be accessed by driving through the tunnel and parking at the lot on the south side of the tunnel. 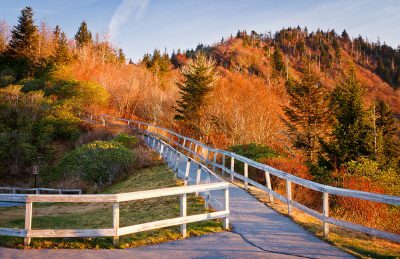 The Craggy Pinnacle walks people through sweet birch trees, wildflowers and rhododendron tunnels. At the top, it offers a 360-degree view of the Blue Ridge Mountains with Asheville’s North Fork Reservoir visible to the east. 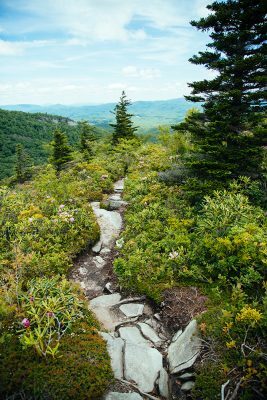 The high-elevation path that leads to Craggy Gardens goes through a northern hardwood forest and a heath bald, and leads through twisted rhododendron tunnels ending at a grassy summit. A shelter constructed with chestnut wood at the top welcomes hikers in bad weather. — R.P. South of Mount Pisgah, a high, flat valley offers two distinctive hikes. One is the 3.2-mile Graveyard Fields Loop Trail and the other the 6.15-mile Graveyard Fields Ridge Trail. The trails pass two of the three waterfalls on the Yellowstone Prong. The Ridge Trail begins along the loop trail and ends at the Black Balsam Knob. One theory for the location’s name is that it came from a windstorm that uprooted many spruce and fir trees, which then looked like a field of gravestones. 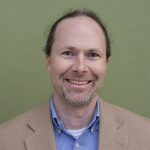 Another explanation cites a fire that occurred in 1925 after extensive logging in the area, leaving stumps that resembled moss-covered gravestones. A fire later burned the stumps and heated the soil enough to sterilize it, depleting nutrients and making it difficult for many plants to grow here. New growth is now prominent. — R.P. The Richland Balsam Overlook at milepost 431.4 is the highest point on the Blue Ridge Parkway at 6,047 feet. Parking is available at the Haywood-Jackson Overlook near Tuckasegee, N.C., at milepost 431, which is where the Nature Loop Trail begins. This moderate, 1.4-mile self-guided and dog-friendly loop trail weaves through a spruce-fir forest and climbs atop the 10th highest peak in the eastern United States. — R.P. 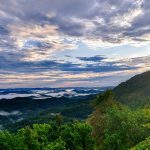 Located 18 miles from the end of the Blue Ridge Parkway, this 1.2-mile moderately trafficked loop trail travels to the summit to witness views from 6,292 feet high. 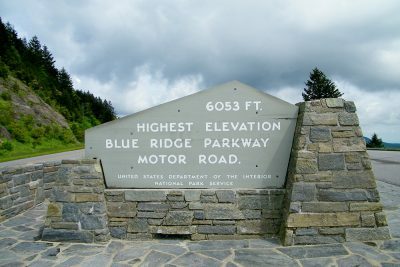 The visitor center at Waterrock Knob is the parkway’s highest at 5,712 feet. Waterrock Knob is located in the Plott Balsams mountain chain, and the peak of the trail provides views of many major mountain chains and four states. The 360-degree viewpoint at the top is known for exquisite sunrise and sunset vistas. — R.P.